The third Conference of Ministers for Spatial Planning and Development was held on 7 – 8 December, 1994 in Tallinn, Estonia. The ministers agreed on a first transnational strategic document for spatial development worldwide – “Vision and Strategies around the Baltic Sea 2010. 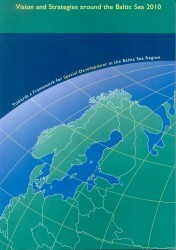 Towards a Framework for Spatial Development in the Baltic Sea Region” (VASAB 2010), that played a significant role for spatial planning and development of the whole Baltic Sea Region. VASAB 2010 describes common principles and spatial structures of the Baltic Sea Region through the three elements: systems of cities and urban settlements (“pearls”), the interlinking infrastructure networks (“strings”) and selected types of land uses in non-urban areas (“patches”) that are promoted by “the system”, i.e., planning institutions, rules and procedures. The VASAB 2010 includes a common vision, sets the goals and proposes the first common actions for the development of urban network of international importance, effective and sustainable links between cities, areas supporting dynamism and quality of life and functioning comprehensive spatial planning in the Baltic Sea Region. Among many innovative approaches the VASAB 2010 is the first policy document that mentions the need for Rail Baltica corridor.